Log in to the Firebase Console. Go to Auth tab and enable Email/Password authentication. This quickstart demonstrates a simple data model for a social application. While this data model uses some of the Firebase best practices, it has some known tradeoffs made for simplicity that would not scale to very large numbers of users. users - a list of User objects, keyed by user ID. So /users/<ID>/email is the email address of the user with id=<ID>. posts - a list of Post objects, keyed by randomly generated push ID. Each Post contains the uid and author properties to determine the identity of the author without a JOIN-style query. Posts contain a stars property which is a Map of user IDs to boolean values. If /posts/<POST-ID>/stars/<USER-ID> is true, this means the user with ID <USER-ID> has starred the post with ID <POST-ID>. This data nesting makes it easy to tell if a specific user has already starred a specific post, but would not scale to large numbers of stars per post as it would make loading the Post data more expensive. 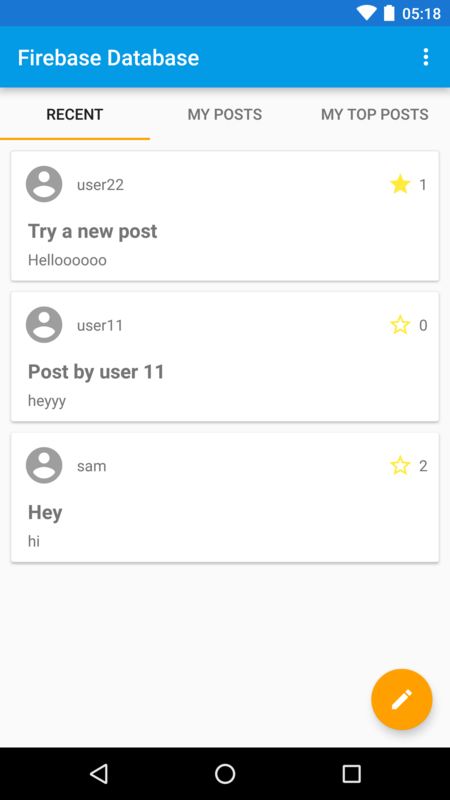 user-posts - a list of posts by the user. /user-posts/<USER-ID> is a list of all posts made by a specific user, keyed by the same push ID used in the posts tree. This makes it easy to query "all posts by a specific user" without filtering through all Post objects. post-comments - comments on a particular posts, where /post-comments/<POST-ID> is a list of all comments on post with id <POST-ID>. Each comment has a randomly generated push key. By keeping this data in its own tree rather than nesting it under posts, we make it possible to load a post without loading all comments while still having a known path to access all comments for a particular post. // Posts can be read by anyone but only written by logged-in users. ".validate": "(data.exists() && data.val() == newData.val()) || newData.val() == auth.uid"
".validate": "data.exists() || newData.child('uid').val() == auth.uid"